While I had an amazing, once in a lifetime, opportunity to visit India for first time while traveling on a luxury train called The Deccan Odyssey, along the Maharashtra and Goa states, I felt that my visit to India could not be complete without visiting the Taj Mahal, 1 of the 7 new wonders of the world. This post aims to provide you with the best travel tips for visiting The Taj Mahal in India. If you are not familiar with the location of Taj Mahal, it is in Agra, India. It is exactly located on the south bank of the Yamuna River. 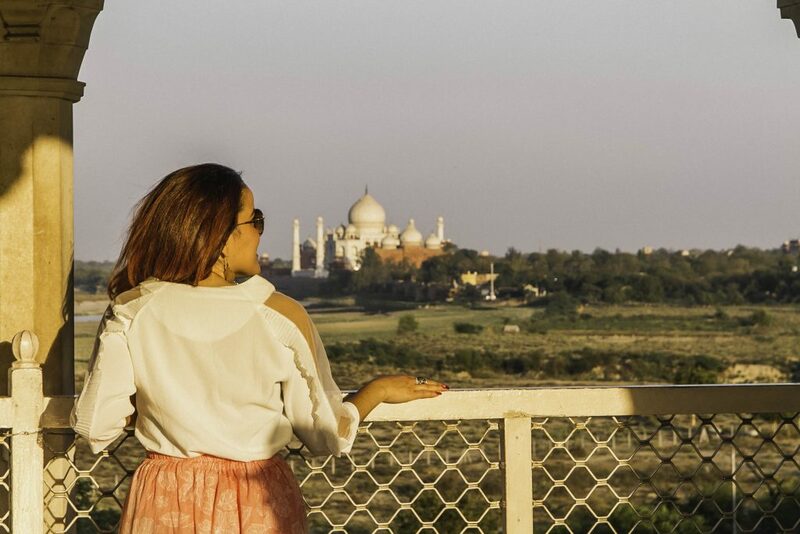 While The Taj Mahal is such a magical place to see, and it’s been on my bucket list for so long, I definitely cannot say the same about Agra itself. Agra is a very dirty, crowded, loud and polluted city (just my opinion, always keeping it real on the blog) and I would not recommend staying there for longer than needed. 1.1.1 1. One night in Agra is more than enough. 1.1.2 2. A taxi/car cannot take you very close to the Taj Mahal. 1.1.3 3. How much is the entrance (cost) to the Taj Mahal? 1.1.4 4. What is the best time to visit the Taj Mahal? 1.1.5 5. Try to only bring what is necessary for the Taj Mahal. 1.1.6 6. Wondering how to take the perfect photo at The Taj Mahal? 1.1.7 7. You cannot take pictures inside the Taj Mahal. 1.1.8 8. How long would I spend at the Taj Mahal? 1.1.9 9. Shopping time! Maybe not. 1.1.10 10. What to wear when visiting the Taj Mahal? First, let’s start with history 101. The Taj Mahal is an ivory-white marble mausoleum inlaid with semi-precious stones (including jade, crystal, lapis lazuli, amethyst and turquoise) forming intricate designs in a technique known as pietra dura. In case you are not familiar with the story behind the Taj Mahal, you totally should be! 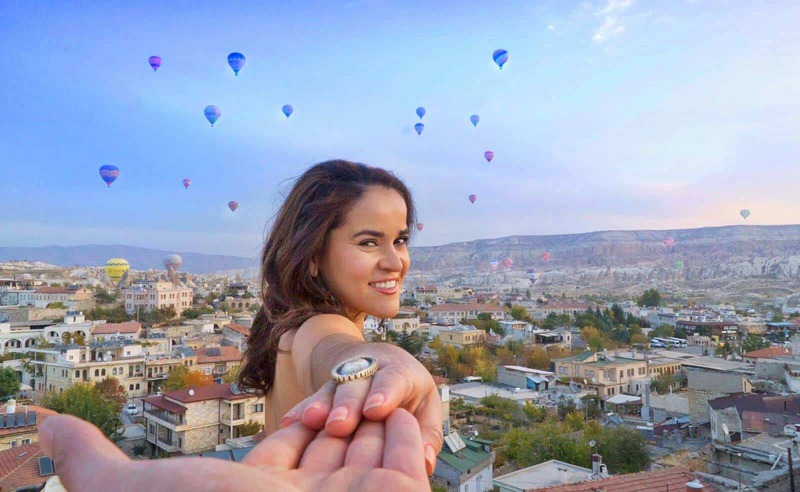 It helps you to appreciate even more when seeing this wonder of the world that’s also known as a symbol of love. The Taj Mahal was done in honor of the third wife/queen and love (Mumtaz Mahal) of the Mughal emperor, Shah Jahan. Unfortunately, in 1631, Mumtaz Mahal died giving birth to their 14th child. Shah Jahan commissioned the construction of the Taj Mahal in 1632 to house the remains of his cherished wife. The famed mausoleum complex took over 20 years to be built. It is one of the most outstanding examples of Mughal architecture, which combined Indian, Persian and Islamic influences. The Taj Mahal is perfect from every side/angle and it was deemed to be one of a kind. It is designed to shine and reflect the different lighting, depending on the sunrays or moon’s glow. It was designated a UNESCO World Heritage site in 1983 and it remains one of the world’s most celebrated structures and a stunning symbol of India’s rich history and culture. If you look at its central dome from up close, it looks like it is not as high but it reaches a height of 240 feet (73 meters) and is surrounded by four smaller domes; four slender towers, or minarets, stood at the corners. It is a magnificent piece of architecture and art. What is inside this mausoleum? Inside the Taj Mahal, there is an octagonal, marble chamber, adorned with carvings and semi-precious stones, housing the memorial of Mumtaz Mahal. NOTE: The tomb is just a representation/symbol, it is actually false. The real sarcophagus containing her remains lay below, at garden level. I hope now you better understand why the Taj Mahal is called a symbol of love! Now that you’re a little more familiar with its history, here are some of the things that I learned, my best tips for your visit, and answers to many frequently questions. 1. One night in Agra is more than enough. I would recommend only planning one night in Agra since there is not that much more to see, other than the Taj Mahal. The way I did it, I had a driver from the Delhi Airport Service pick me up from the train station in Delhi. 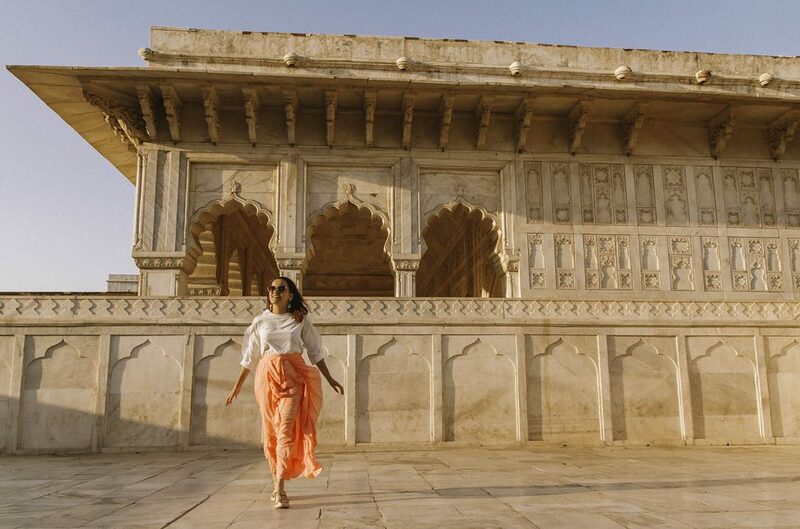 I was coming from an amazing trip around Amritsar (a city you should not miss while in India) so I arrived in Agra around 2:30pm and then proceeded immediately to visit the Agra Fort. It was totally worth it! From the Agra Fort, not only can you see the Taj Mahal, but also enjoy some golden lights, amazing architecture and history. 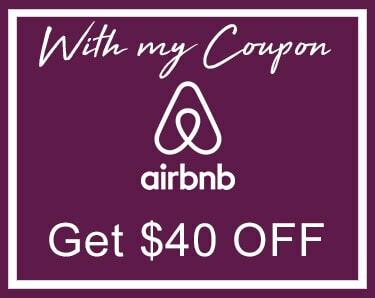 I found great deals online and booked all my accommodations in India on Booking. 2. A taxi/car cannot take you very close to the Taj Mahal. You will need to either walk for like 10 minutes or, if you prefer not to walk, or you want to get on line for the entrance faster, you can take a rickshack for like 100 rupees ($1.50 USD). 3. How much is the entrance (cost) to the Taj Mahal? The entrance to Taj Mahal is 1000 rupees for foreign travelers (tourists), while for Indian citizens it is much less. As a tourist, you get a free bottle of water and shoe covers. 4. What is the best time to visit the Taj Mahal? Wanna see the sunrise on this majestic building? Wake up super early and try to be there by 5:45am. Even at that time, the line is already long. The best way to skip the line is by hiring a tour guide. They do have access to go in a different way, which makes the entrance much faster. 5. Try to only bring what is necessary for the Taj Mahal. I would suggest to only bring things like your camera, phone and some money. It will make the security check faster and your entrance easier. They do not allow you to bring your own water, no snacks, no tripods, etc. Note: If you do not need a bag, do not bring it. It makes the process slower for your entry. They have a different security procedures for people with bags and it takes longer. 6. 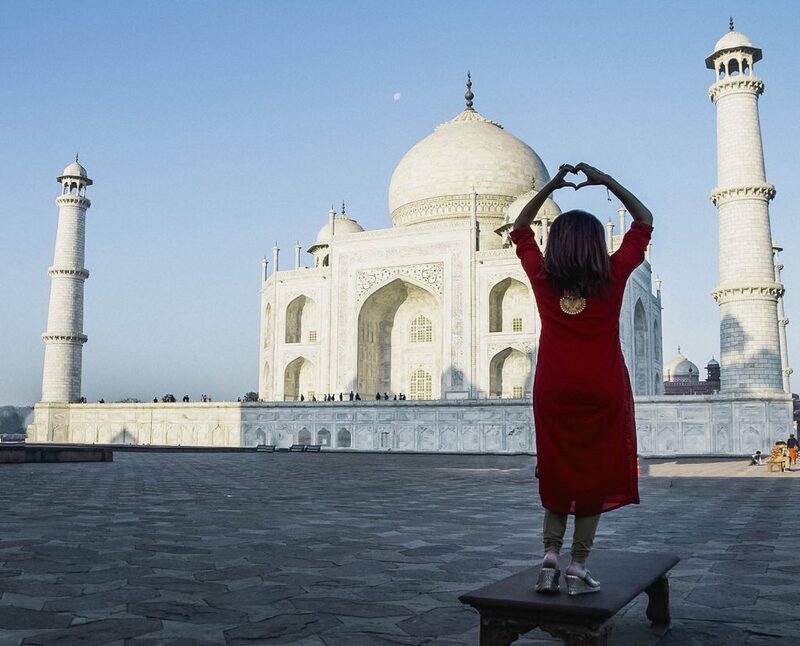 Wondering how to take the perfect photo at The Taj Mahal? Some people say that the best pictures are from the park behind the Taj Mahal. I did not get to go there, but I still took some epic shots. I had to find windows of opportunities when there were not as many people, or find different angles to take the picture from. I did notice that people stand at the same spot for sunrise, but if you wait longer, they will move on to other areas and you’ll have more flexibility with fewer people interfering. You can take pretty great shots from the east gate, if you wait for the perfect timing. 7. You cannot take pictures inside the Taj Mahal. 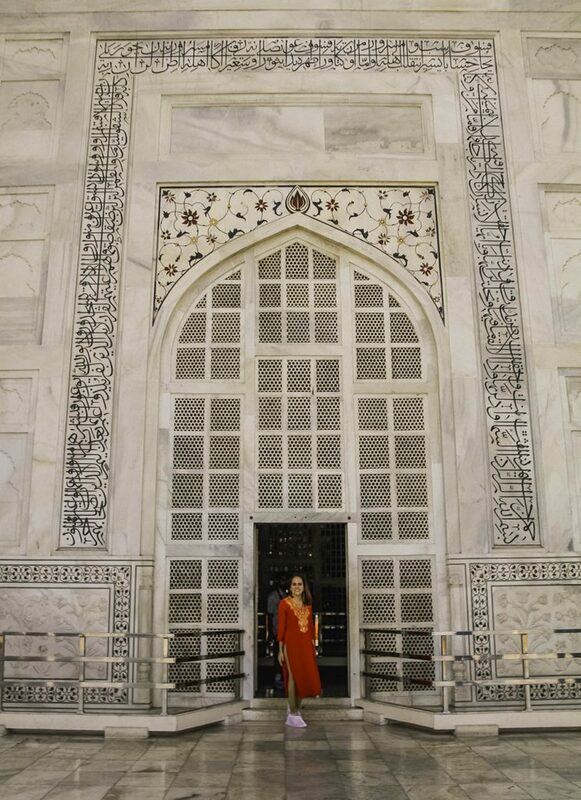 The taking of photos or video is not allowed once you enter inside the Taj Mahal since it is a mausoleum. Remember, this was commissioned by the emperor as a memorial after the death of his cherished wife thus, in the end, it is a place for paying respect, a memorial. It is definitely worth seeing the inside of this majestic white marble up close and to think for a moment how this took over 20 years to be built. NOTE: In order to walk in, you do need to wear the shoe covers provided to you when you paid your entrance fee. As always, some people try to sneak a few pictures, but if security catches you, they will definitely say something right away and even make you delete the picture. Some things you must just let go and experience for yourself. A picture can never do justice anyway. 8. How long would I spend at the Taj Mahal? You can easily spend 2-3 hours, half day or more. 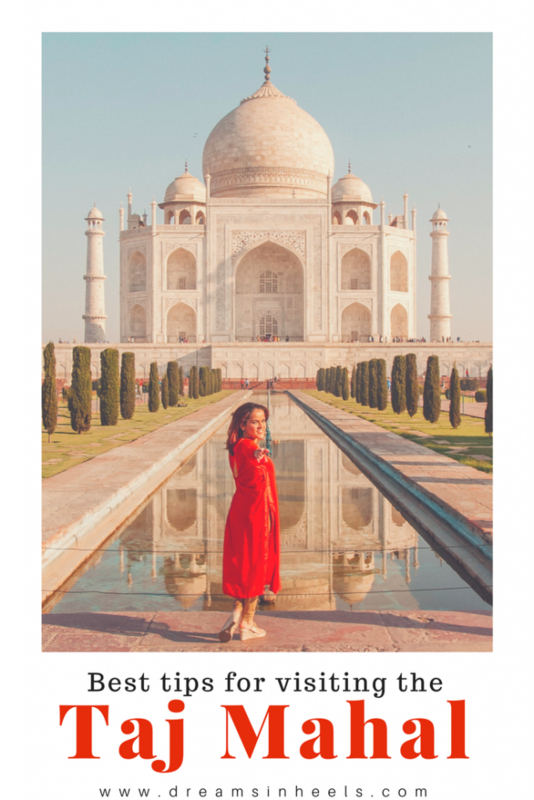 It all depends on the person and on how many selfies and photos you want to take, or how much time would you just want to stand in a ‘wow’ moment admiring the Taj Mahal. 9. Shopping time! Maybe not. I would not recommend shopping around Agra. Everything is pricier than in other places. Also, you will find lots of tourist traps here. Save your money and shop elsewhere. 10. What to wear when visiting the Taj Mahal? It is up to you! 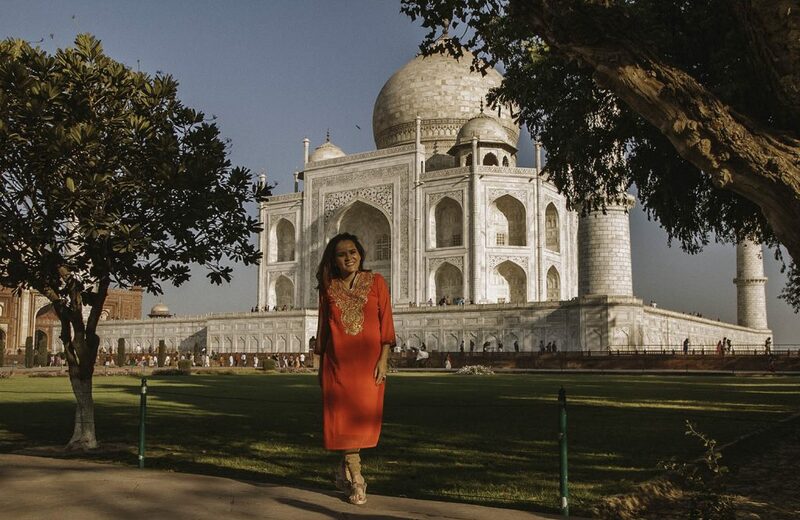 There are not guidelines per se, but I would suggest that you wear bright colors, since the Taj Mahal is an all white marble structure. I chose to wear red and gold, because red is a very powerful color and gold is super royal. I especially felt that the red looked amazing against the Taj Mahal. Many times I took the photos and sometimes there was a line, so I had to say, “Sorry, I have to go.” The funny part is, someone did take out money to give me the 100 rupees. Of course I did not accept it. Anyhow, locals are amazing, but they do look at you oftentimes with excitement and really want to take a picture with you. Sometimes, it is cute. I guess it all depends on how much you enjoy photos. 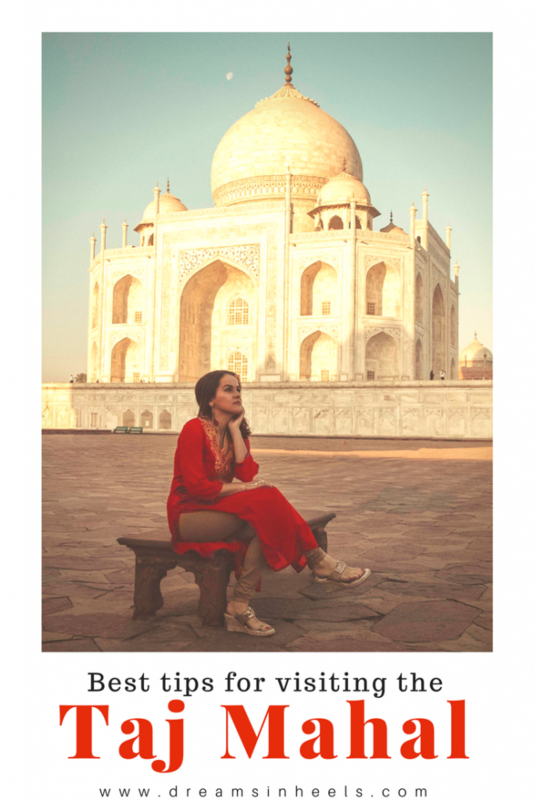 Overall, my visit to the Taj Mahal was an incredible, once in a lifetime experience that I definitely suggest for you to experience for yourself. I hope these tips for visiting the Taj Mahal will help you to plan your visit. If you are in India, especially visiting Delhi, which is not too far, the Golden Triangle is a truly beautiful route to go on an adventure. But always remember to research some India Travel Tips and that there is much more to India beyond the Taj Mahal. Special Note: Thank you to Delhi Airport Service for taking me on The Golden Triangle Route. I truly fell in love with the places we visited. As always, all my opinions are my own. What a wonderful post with a great ideas. India is one of the most beautiful country indeed. Thanks a lot for these information.